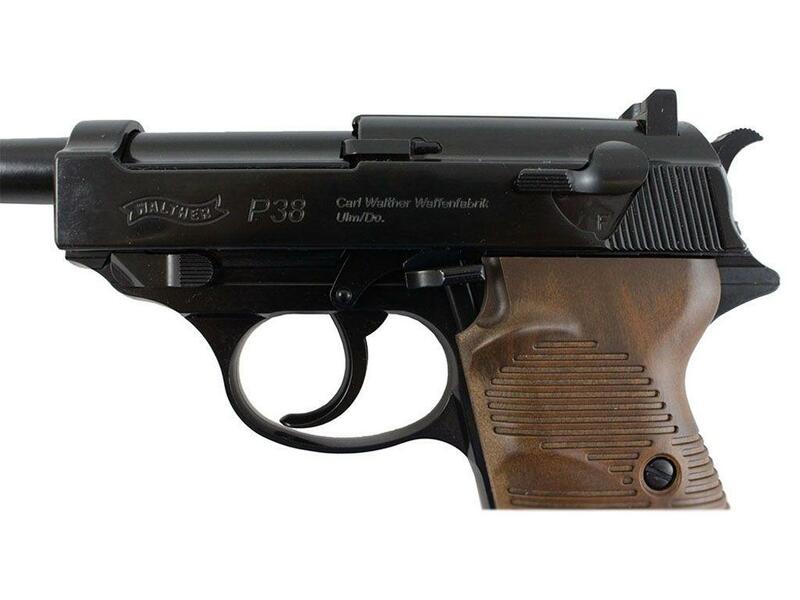 Umarex Walther P38 CO2 Blowback BB Pistol | ReplicaAirguns.ca | Easter Weekend Sale! Trigger Pull: The trigger pull on the Umarex Walther P38 CO2 Blowback BB Replica is a bit heavier than I expected it would be as it is a single action only trigger. There is a lot of take up initially but once you hit the release area, the release point is what I would describe as a medium to heavy pull for a single action shooter. With that said it did not seem to affect the accuracy at all and I was able to rifle off quick shots fairly easily. Accuracy: I shot the Umarex Walther P38 BB Pistol at a target from 20 feet away in a semi rested position, and it performed very good getting just under a 2 inch grouping and very well centered on the target. The sights are not adjustable so adjusting the Umarex Walther P38 would not be possible except by using a modified aim point! My initial Chrony testing puts this BB shooter just under the 400 claimed fps range right in the 380 area which is not bad considering the rather cold day I was shooting on. I also managed to get five magazines worth of shots which is a very respectable 100 shots per CO2. Build Quality: The Umarex Walther P38 CO2 Blowback BB Pistol is almost all metal with the exception of the grips which are great to see! I found the fit and finish to also be very good with a nice semi-gloss paint job that should wear well over time. Interestingly enough the Umarex Walther P38 has a removable barrel so I am assuming that perhaps Umarex will introduce some more barrel length options at some point? 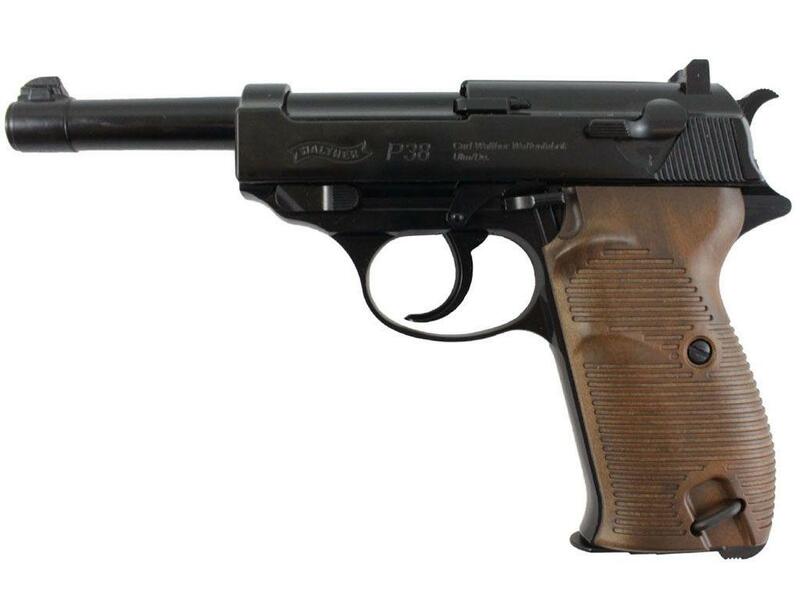 Realism: The Umarex Walther P38 CO2 Blowback BB Airgun is very close to the real steel Walther P38 and even has the Walther P38 licensing on it. What I was really impressed with was the fact that all the mechanical parts do exactly what they would do on the real gun. On some other guns these parts are merely for show and moulded into the gun. 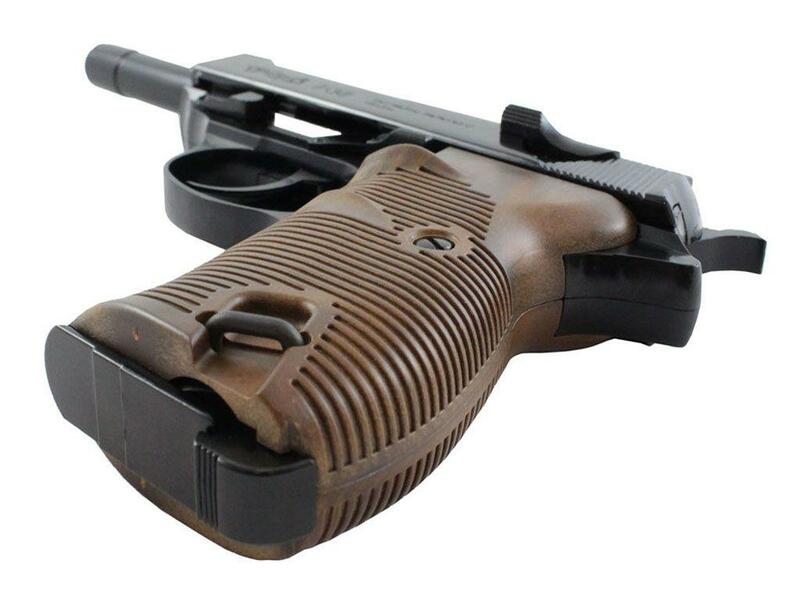 The Blowback action, hidden CO2 screw and recessed barrel all help to make this Walther P38 Replica very believable! Glad to see a World War BB replica pistol! 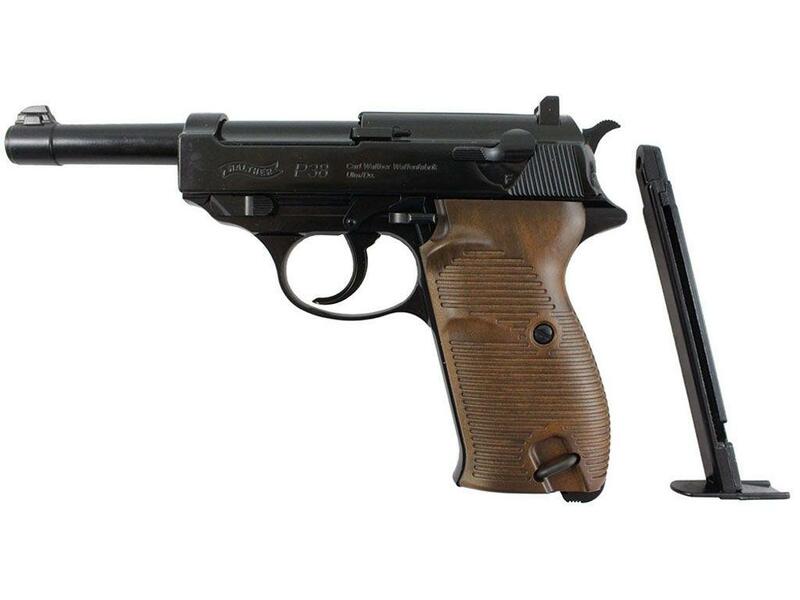 Comments: There are few older Classic Airguns out there, especially ones from the World War era! On that topic I would also like to see some old Single Action Army Cowboy Revolvers start to show up in the Replica Airgun market! As I was saying it is nice to see this Classic Walther P38 show up in what seems to be a sea of modern styled airgun replicas. Umarex not only came out with a BB shooting Walther P38, they made it very believable in terms of operation, while maintaining good overall airgun performance. I hope this is a trend that continues in the direction of companies offering more quality airgun replicas of guns from the past. Absolutely love this pistol. Full drop mag would've been nice. Other than that for 100 bucks this thing out performs pistols I've paid 200+ dollars for. Get em while they're hot! I love this gun, it looks the part and sounds the part, that was actually my only problem with it, its noise level was surprisingly loud. The only other problem was the trigger for single action is quite heavy. Still it is a great bb pistol! Thought I had better write a review since the gun is so authentic. All the markings are just like the original-I used to own one. The black chrome finish is super. I haven't shot it so I cant comment on that part, but I did notice that the slide wobbles slightly-I never noticed the original one doing that. Too bad the grips feel so much like cheap plastic, I think the thickness is to blame since the original grips were also some kind of plastic but felt more solid. 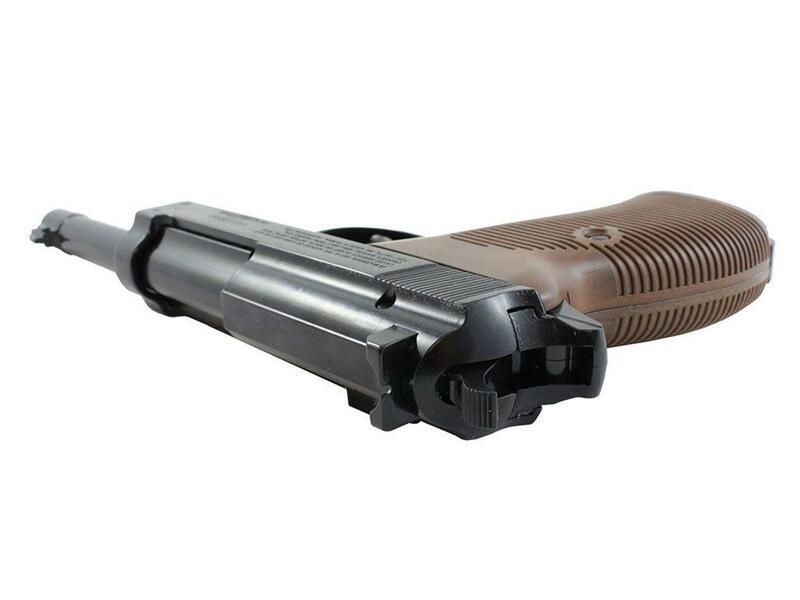 Umarex Walther P38 CO2 Blowback BB Pistol Table Top Review. 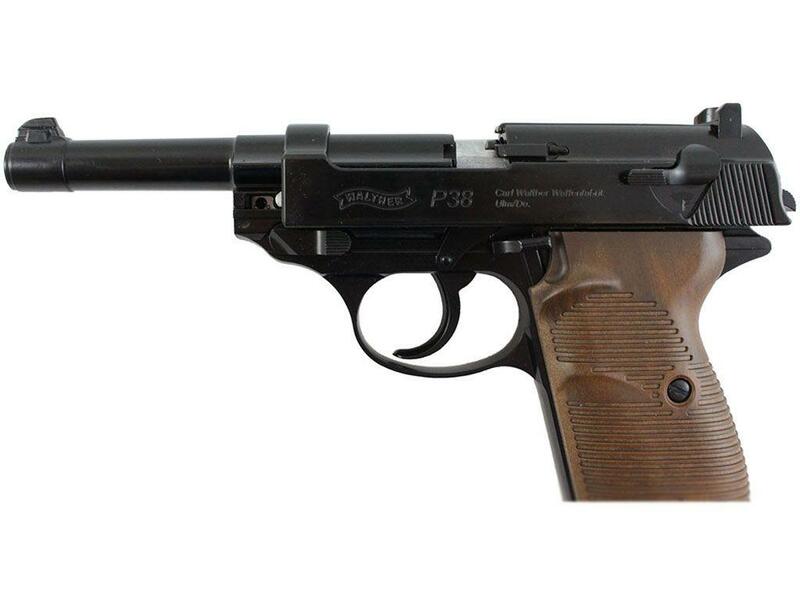 http://www.ReplicaAirguns.com - Umarex Walther P38 4.5mm CO2 Blowback BB Pistol Table Top Review. In this Video Table Top Review of the Umarex Walther P38, I talk about its main features and benefits and show you around this fine replica air pistol in detail. I also do a preliminary shooting test and even show you some quick chronograph and accuracy testing along with some miscellaneous shooting from a first person perspective using my Liquid Image Action Camera Goggles. 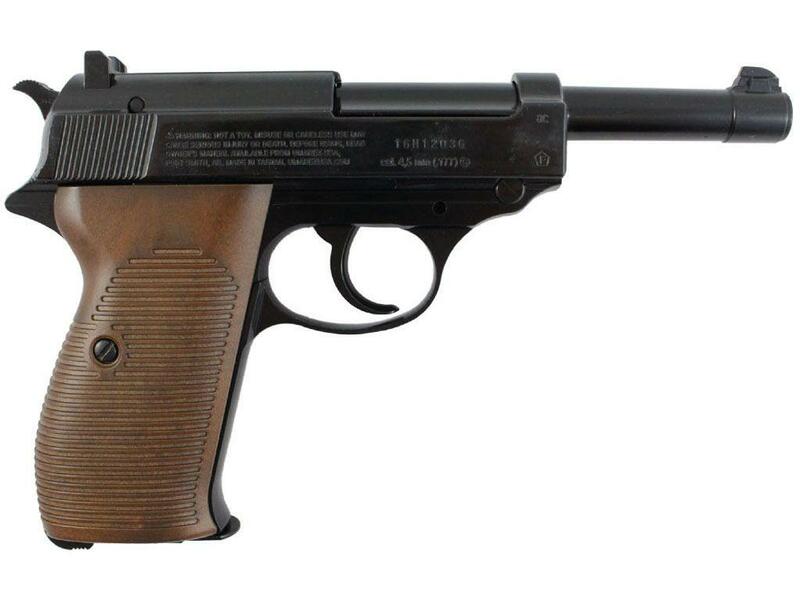 There are few older Classic Airguns out there, especially ones from the World War era! On that topic I would also like to see some old Single Action Army Cowboy Revolvers start to show up in the Replica Airgun market! As I was saying it is nice to see this Classic Walther P38 show up in what seems to be a sea of modern styled airgun replicas. Umarex not only came out with a BB shooting Walther P38, they made it very believable in terms of operation, while maintaining good overall airgun performance. I hope this is a trend that continues in the direction of companies offering more quality airgun replicas of guns from the past. http://www.ReplicaAirguns.com - Umarex Walther P38 4.5mm CO2 Blowback BB Pistol Field Test Shooting Review. At least the accuracy portion came in just about the same with an approximate 2 inch grouping shooting at the target from 20 feet out in a semi rested position. I did shoot a bit to the left and a bit low which I could adjust form left to right but since there is only a windage adjustment I would have to sight a bit up to hit the bullseye with the KWC M1911 Model A1 TAC. This time around I also got 4 magazine worth of shots as I slowed things down a bit and took my time and juts like last time I had no problems or malfunctions with my KWC M1911 Model A1 TAC. The best part about shooting the KWC M1911 Model A1 TAC CO2 Air Pistol is it's beautiful single action 1911 styled trigger and nice heavy full blowback action, making this gun a great economical trainer if you own the real steel version or perhaps just want to feel like you do!